The next section of the test that really worried Vera was the Listening section. Surprisingly, this is a very difficult part of the exam. Vera had a problem following people even in her native tongue. This is why she embarked on nearly one hundred listening tests. Between April and July, she did one or two tests every single day. In August, she took a two-week vacation doing five or six listenings per day. Vera knew that this dedication to the listening section may have been a bit excessive, but it did pay off. She received a score of eight for listening. Vera used the IELTSpodcast courses to prepare for the exams. She passed with flying colours. She scored 7.5 for Speaking and Reading. For Reading, she had expected at least an 8. She felt that the problem lay in the fact that she had prepared using more academic reading even though she would do the general test. There was just more academic revision material available. She had attended speaking lessons where her trainer had told her that she was capable of an 8.5. The 7.5 result was, therefore, disappointing. She attributed her band loss to speaking off topic. Overall, Vera achieved a score of 7.5. It was the result of Writing 7, Speaking 7.5, Reading 7.5 and Listening 8. Looking back, Vera recommends that all students that struggle with essay structure should sign up for the podcasts. The same applies to those who cannot come up with great ideas for essays. Ideas, of course, are vital for good essay marks. The course helps to give structure to your ideas, but it will not teach you basic English. It will help you to pass because it teaches you techniques. No course will take away the need for hard work and practice. That’s up to you, but this course shows you clever ways to use your English language grammar and vocabulary to pass well. So, you buy the course. Do the work. Complete the essays. Send them in for evaluation. Read the feedback and then do another essay and repeat. You have to work consistently, as much as you can every day. The feedback helps you to focus on your weak points and develop your strengths. It helps to give you the confidence to walk into the exam room and gain the score that you deserve. Vera is a working mother and she has managed to pass the first time around. 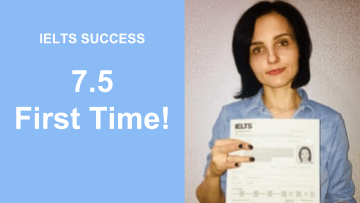 She credits hard work, visualisation techniques and the brilliantly structured IELTS Online course for her success in achieving IELTS 7.5.